Just an old photo that I want to share. Both the woman and the child seem amazing to me - very beautiful and enigmatic. They seem to be looking into the future, unknown to them at that point, but known to us now... not their personal future, of course, but the overall history of the region and people. I do not know who they are, but obviously they were from a rich family, judging by their clothing and her jewellery. The woman's hands are obviously not familiar with hard work, and are heavy with lavish rings and bracelets. Note that their gowns are made from the same gorgeous ikat silk. The woman is wearing 'tilla kosh' headpiece - 'golden brows' - and a shawl, which could be Russian, judging by what I can see from the pattern. Beautiful! 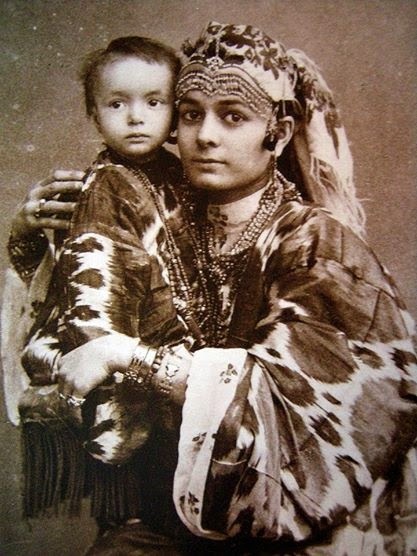 Woman in full wedding regalia with child, photograph ca. 1860, Registan Museum, Samarkand. Stunning photo! I love old photos as in my opinion they are telling more than the modern ones and I also in love with black/white colors coz they show more individuality as you don't pay too much attention to vivid colors. Thank you! I share your love for old photos. They do have a very special feel. As for your ikat blouse... you are so good with making things - I am sure you will turn it into something very nice. Жень, а вот скажи, сейчас в Узбекистане где-то еще можно найти невесту, одетую так красиво, традиционно, в полном свадебном облачении? Или это уже редкость, оставшаяся только на фотографиях и в сундуках у старушек? Лена, сейчас они одеваются несколько иначе. В основном на свадьбу надевают "европейское" белое платье с фатой; это уже обязательно. Но потом церемонии продолжаются, и невеста может переодеться в узбекский наряд. Или, наоборот, начать с него, а потом надеть белое... эх... поищу фотографии, были интересные. Все никак руки не дойдут. Gorgeous photo. Thank you for sharing this beauty! Thank you, Olga! I am glad you like it, too! Очень интересная фотография. Хочется рассматривать и рассматривать и наряд и лица людей и как бы заглянуть в ту эпоху. Спасибо. Lutheran Church in Tashkent. And Merry Christmas!